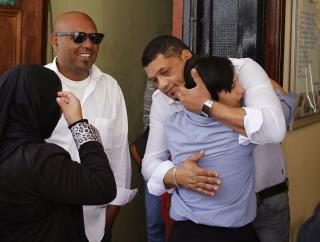 (Newser) – The incredible saga of Zephany Nurse has reached its end: The South African woman found guilty of snatching a 3-day-old Zephany from her sleeping mother's hospital room in 1997 has been sentenced to 10 years in prison. Prosecutors had sought 15, reports Reuters. Judge John Hlophe had harsh words for the 51-year-old, who has not been named so as not to reveal the identity she gave to Zephany: "One would have expected you to apologize but you chose not to. It's also very clear you have caused much harm to Zephany. You have actually betrayed her‚" Times Live quotes him as saying. The BBC reports Hlophe also cited the birthday celebrations the Nurses held each year for their absent daughter, which were covered by the press and meant it was clear the family was still looking for her. Why wasn't she returned to her parents??? I find it amazing that the school kids are the real heroes for recognizing a family resemblance between the sisters. The sentence should at least match the length of the kidnapping.